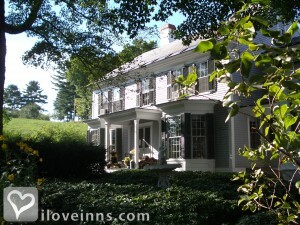 Walpole bed and breakfast travel guide for romantic, historic and adventure b&b's. Browse through the iLoveInns.com database of Walpole, New Hampshire bed and breakfasts and country inns to find detailed listings that include room rates, special deals and area activities. You can click on the 'check rates and availability' button to contact the innkeeper. Walpole, New Hampshire is known for its importance in the country's literary history because it is the birthplace of famous writers such as Luisa May Alcott and Bronson Alcott. The attractions in and around the town are Fall Mountain, Alyson's Orchard, Academy Museum and Walpole Historical Society Main. Shoppers will enjoy browsing Boggy Meadow Farm and The Grafton Village Cheese Company. Jim's Arcade is the nearest theme park and is located in Bellow Falls. North Round Pond is the favorite trout fishing spot in Walpole. Guests staying at Walpole bed and breakfast inns who want a bit of golf can try Hooper Golf Club. This is only several minutes of drive from the inn. By Inn at Valley Farms B&B and Cottages.